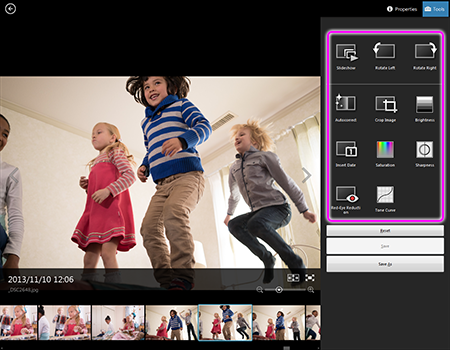 "PlayMemories Home" is loaded with many different functions for editing photos. 1. From the Calendar or Folder view, select the photo to edit and display it in full screen. 2. Click " Tools" in the upper right of the screen and select your desired edit function. 4. When you finish editing, save the photo. The use of a flash when photographing people can cause a red reflection in the eyes of subjects. You can correct the red-eye portion of photos. You can delete unwanted sections of photos. You can insert a date stamp into photos. You can correct the brightness and contrast of a photo to the most suitable levels for that image automatically. The brightness and contrast of photos can be corrected to your preference. You can adjust the saturation levels. You can adjust the brightness of each channel. You can emphasize the outline of photos. - To change the date and time stamp, from the [Edit] menu, select [Change Date of Selected Media Files] to display the [Change Date of Selected Media Files] window. Change the data and time stamp and click [OK]. - You may not be able to edit some photos such as those taken in Multi Burst or RAW mode.